Area General Manager and Director of Sales and Marketing at West Wood Clubs, with 39,000 members at six clubs in Ireland and one in Bosnia. Sales Trainer and International speaker on fitness business marketing. Board of Directors of IHRSA (International Health, Racquet and Sports Association), based in Boston, USA. Since 2010, Alan has been engaged as an international speaker and presenter on fitness business marketing. He's presented to 1000's of club managers & owners at fitness conventions in San Francisco, Las Vegas, Chicago, Los Angeles, San Diego, Brazil, Mexico, Iceland, Austria, Spain, United Kingdom, Sweden, Finland, Italy, Poland, Russia & more. - IHRSA (International Health, Racquet & Sports Association). - Smurfit Business College -Masters of Marketing. In 2014, he joined the faculty of The IHRSA Institute at the Kenan-Flagler Business School at The University of North Carolina, USA, lecturing on Marketing Strategy and Sales Management. Alan has won Direct Marketing awards for fitness marketing competing against Irelands top advertising agencies. He's won a FIA award for fitness marketing. In 2011, he was invited to join IHRSA’s ‘Ask An Industry Leader’ online forum. Alan has been featured in IHRSA CBI magazine, Club Solutions magazine, and many other 'international' fitness marketing publications. With more than 20 years of experience managing, owning and franchising health clubs, Chuck Runyon has distinguished himself as a leading authority in the field of fitness. Runyon revolutionized the fitness industry when he and Dave Mortensen co-founded Anytime Fitness – an alternative to big-box gyms which typically feature expensive “frills” that few members actually use or need. Under Runyon’s leadership, Anytime Fitness has earned numerous industry accolades, including the #1 Franchise on the planet, according to Entrepreneur magazine in 2015 & 2016, “One of America’s Most Promising Companies,” according to Forbes, and the “Fastest-Growing Fitness Club in the world,” according to the International Health, Racquet and Sportsclub Association (IHRSA). Additionally, Anytime Fitness has been honored as a “Top Franchise for Minorities” and “The Best Place to Work in Minnesota” three years in a row. For episode 56, where learning and growing from the CTO of FitMetrix, Josh Lloyd about using technology for the member to win. This is something that we explore quite a bit on the show, but this is a deeper discussion where we are learning from Josh about the strategy and tools that will connect the sometimes disparate technology silos inside and outside the club to help bring them back together. 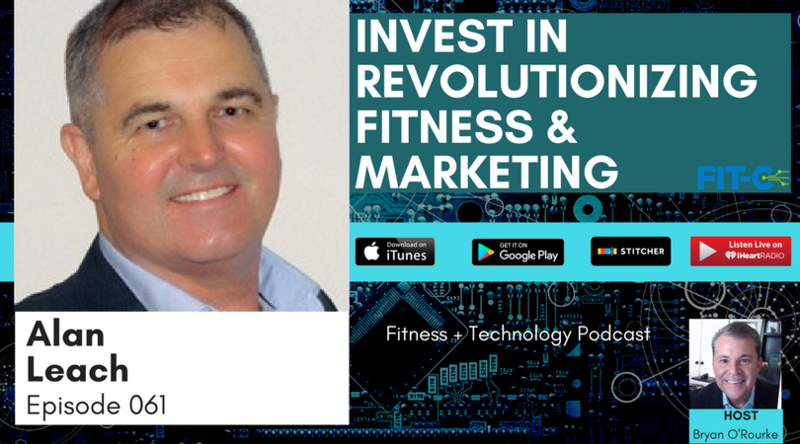 In this podcast we're talking about not only how to use technology to enhance and uplevel the customer experience but also how to incentivize healthy living through data points collected via gamification and that relationship to smart push notifications sent to members. FitMetrix was founded in 2013 to solve a need around group training but has now evolved to a more robust platform that does much more by bringing in best practices from outside the fitness industry: FitMetrix has significant technical experience and believes customer service is the most critical path to success. With technology racing ahead faster than ever before what are the smart data sets that club owners and operators can piece together in a tracking solution designed to increase member retention while giving clients better results? The answer to that question and much more takeaways for club owners, operators, and fitness pros in this episode with Josh Lloyd. Josh Lloyd is the co-founder and CTO of FitMetrix, which provides state of the art technology to gyms and health clubs to give members the ability to schedule, train and receive real-time tracking of effort and performance through a facility’s website or customizable app. FitMetrix has partnered with hundreds of gyms across the nation, including Life Time Fitness, Gold’s Gym, Cycle Bar, Cooper Institute, US Fitness and more. Prior to co-founding FitMetrix, Josh was the co-founder and visionary of ShopVisible LLC, which provided business owners with smart technology that combined solutions for customer service, back office, inventory, marketing, accounting and IT into one SEO friendly tool. Due to the success of ShopVisible, Josh was ranked as one of Atlanta Business Leaders’ Top 25 Entrepreneurs in Atlanta in 2012. Prior to ShopVisible, Josh was the Director of Research and Development for CareMedic Systems Inc., as well as Omega Systems Inc.
Josh has a bachelor’s degree in business from Florida Atlantic University and has 20 years of experience in professional software development. The merging of the inside club data and outside club data is more important in 2018 than before. Josh believes that smart aggregate data from treadmills, ellipticals, rowers, and other cardio pieces can be used to tailor the member experience by tying them into a deeply functional tracking solution. By getting the information from the member's exercise sessions while in the club, proactive fitness facilities can now reach more of an emotional context for motivation by delivering detailed and actionable incentives to members. Josh speaks to the power of using leaderboards to drive more members to a successful health journey. At the end of the day when the technology is not there, you're self-regulating. When a member's stats are up on a leaderboard at the same time of the people next to them, they are going to push themselves harder, and everyone's going to push themselves harder, which creates a more dynamic class experience that they'll tell their friends about. When we view the power of wearables and creating a true ecosystem that is built for the member to win, clubs that partner with insurance companies and medical fitness organizations will now start to rise above their competitors as we look towards 2018 with more tools, technology, and the need for programs that reward people at their deepest needs. On episode 055, get ready for a compelling and insightful conversation live from Titleist Performance Institute in San Diego, CA with its Co-Founder Dr. Greg Rose, a pioneer in 3-dimensional biomechanics, strength and conditioning, and expert in fitness technology. In this podcast we're taking a deep dive into the success of TPI and it's impact on the fitness industry as a whole. If you are a fitness pro or operator that has been curious about using technology, apps, and movement screens to deliver better results to your clients and revenue to the club, you're going to enjoy this thought-provoking show. Greg has also been an integral component in the creation of the "Jugamos Todos" program developed by TPI Sports, working in conjunction with the Mexican Ministries of Health and Education, along with the support of the Mexican Football Federation by launching this Physical Education Program deployed across the country's elementary schools to create a sports movement based program, as one of the foundations for thier official FEMEXFUT app-based Youth Pathway. What new technology can fitness pros and operators begin to harness that support low-cost movement screening, help fight childhood obesity, and deliver more ROI to clubs? The answer to that question and much more takeaways for club owners, operators, and fitness pros in this episode with Dr. Greg Rose. Greg is a board certified Doctor of Chiropractic and holds an engineering degree from the University of Maryland. Greg specializes in assessing and treating golfers, 3-dimensional biomechanics, strength and conditioning, manual therapy, rehabilitation, nutritional supplementation and therapeutic exercises. Combining an engineering background with an expertise on the human body, Greg helped pioneer the field of analyzing 3-dimensional motion capture models of the golf swing. That research has helped golf professionals all over the world gain a better understanding of how the body works during the golf swing. Greg also helped develop the Selective Functional Movement Assessment (SFMA), a revolutionary movement assessment that helps identify altered motor control and guides medical practitioners on how to treat patients more efficiently. Greg frequently appears on the Golf Channel. The TPI certification seminar series has made Greg one of the most requested speakers in golf health and fitness. He has lectured in over 21 countries and has been featured in many golf and news publications. When we understand the next level of results-driven fitness technology, diagnostics are everything. Greg shared in our podcast that screening with the right technology first and programming second will create optimal results and the help to support the best movement patterns. There any many technology apps, devices, and ways to screen an athlete in both golf and general fitness out there, and exercise prescription and periodization should only come after effectively screening the athlete or the client. Greg believes that over the next several years we will see a unique way to tailor exercise programs to the client through a kiosk that screens for movement in our big box clubs. With the exponential growth of fitness technology, the screening capability and quality assessment tools will become even less expensive and ubiquitous in the industry which will lead to an increase in personal training packages and member engagement. With youth obesity of an all time high, Greg sees technology as one of the causes of the problem and also simultaneously the solution. The specialized app created to help Mexico youth is just a first step on the path to using technology as a powerful tool to move the needle back to health. We are becoming more clear everyday about the fact that in the age of a technology revolution, its really hard to get kids to move, so if we want to win the battle against childhood obesity, we must use smart technology to do so. For Episode 052 we're joined by Simon Hall, Principal Consultant at Fitness Business Experts and the General Manager of MYPT App, to show us the strategies needed for leveraging technology and social media for generating leads, creating an engaging community experience, and increasing customer retention. Even in our fast-paced digital world, we still see a serious lag in the adoption of social strategies and new technologies with many of today's clubs and personal trainers. This failure to take advantage of social platforms and new advancements in the fitness space will cause many facilities to suffer as others begin to offer a more exciting and emotionally engaging experience. Coming up, Simon breaks down the concept of creating a "Club-Within-A-Club." With the recent success of studio and boutique training centers, he shares how larger gyms can create a similar appeal within their existing facilities by transforming the experience around exercise classes. We discuss how many forward thinking club's now have specific ecosystems for their group training programs through using new technologies, upbeat music, and specialized branding. These features add a custom feel for the members and fosters a community around these segments of the gym that provide their own unique atmosphere apart from the main facility. We also talk about the shocking statistics of members who aren't aware their gyms are even on Facebook. Simon explains the importance of having someone to be the technology "Champion" in the club, who takes charge of social media interaction, and leads the digital front for customer retention. It's one thing to have the technology, but implementing and bringing it to the consumer in a seamless way calls for someone who is tech-savvy, enjoys creating content and posting on social platforms, and has a true passion for building a trusted bridge between their customers and tech. With the high level of competition and rising consumer expectations in our industry, how can clubs and fitness professionals take advantage of new technologies and social platforms to offer a unique experience, build an engaged community, and increase member retention? The answer to that question and much more takeaways for club owners, operators, and fitness pros in this episode with Simon Hall. From hotel health club receptionist to respected industry consultant, Simon has held key roles: General Manager of Fitness & Marketing for the New Zealand YMCA, Manager of the Australian & New Zealand Fitness Industry Survey, consultant to many leading independent and popular fitness club chains. He was also Chairman / board member of Fitness New Zealand. As Principle Consultant at Fitness Business Experts, he assisted all types of fitness businesses and operations to manage their business, improving operational efficiency, setting and managing marketing strategy, membership sales processes and training and anything to improve their bottom line. Simon is also the General Manager of MYPT App, a mobile app development company. MYPT has created a Personal Training management platform for trainers to manage all aspect of their business from lead generation to accounts tools and client management. Along with his proven insights on fostering a deep connection between clubs and their members, Simon is also revolutionizing how personal trainers manage their business with MYPT App. This incredible lead generation tool is opening the door to hundreds of new potential clients for qualified fitness professionals in their local areas, as well as offering the payment and accounting systems that trouble so many small business owners. New combination boutique studios that combine 2 or more offerings such as yoga, spin, boxing, group training, etc. Clubs have no choice and now must fully embrace social media as an important tool for customer retention and member engagement. Currently, even though the majority of clubs have Facebook Pages and most their members are on social media, many facilities are failing to leverage these powerful platforms to connect with their customers. Simon recommends simple actions like displaying your social feeds on screens in the lobby and having group trainers casually invite members to engage and tag their gym and workout on social media. Many trainers have a difficult time with lead generation and managing the accounting side of their business. If a fitness professional would like to spend more time perfecting their training craft and less time attracting new customers, there are now technologies that can solve this problem. The MYPT App is creating leads by pairing trainers up with local clients in need of their services while also providing calendars, scheduling, reminders, payment processing and so much more. Simon shows us the increased potential of fitness technology when combined with a "Champion" in the club who can lead the technology charge. In an era of exponential technology growth, what's most important to fitness professionals and operators is to understand where they are missing opportunities to engage and increase retention by formulating a trusted bridge between their customers and the technology. For Episode 51 we are joined by Garrett Marshall, Divisional CEO of Fitness On Demand, to discover how digital video programming is helping facilities enhance personalization, take advantage of underutilized space, and provide a greater variety of exercise formats to the consumer. We're also exploring how to leverage the consumer fitness groundswell in our space. Fitness On Demand™ is a market-leading delivery platform of virtual fitness. Since 2010, their services have allowed facilities around the world to economically deliver premium fitness programs to their users. With programming and services designed to optimize space, streamline operations, and offer unparalleled variety, their services are a perfect addition to fitness facilities, apartment complexes, hotels, and more. It's been shown that on average, functional training and studio rooms inside of clubs remain vacant 60-70% of the time. These new technologies are allowing facilities to capitalize on this space and provide a new digital experience to their members. Aside from the traditional gym setting, we also see this feature becoming a powerful amenity at resorts, hotels, and health facilities who want to provide their customers with an effective and engaging workout experience 24 hours a day. With the groundswell of consumer health and fitness awareness on the rise, how can we leverage these cloud hosted technologies to take advantage of underutilized space, reduce operating costs, and provide members with unique and engaging workouts? The answer to that question and much more takeaways for club owners, operators, and fitness pros in this episode with Garrett Marshall. Garrett Marshall is the Divisional CEO of Fitness On Demand™, a market-leading developer of fitness delivery products for media and programming. Garrett combines a breadth of experience with an industry-specific, laser-focused, career path. Investing himself fully in each opportunity along the way, Garrett has been fortunate to play a role in several successful fitness businesses. His achievements span a variety of employment positions in small and large organizational settings. In the past, he served as a consultant to the commercial division of Snap Fitness, the Chanhassen, Minnesota-based franchisor of compact, state-of-the-art, 24/7 fitness centers, and as the manager of business development for Fitness on Request, based in North Maple Grove, Minnesota, which also markets video-based group fitness workouts. His first foray into the industry was as a membership sales associate with Life Time Fitness, Inc., a chain of large, full-service clubs based in Chanhassen, Minnesota. The Fitness On Demand mobile application that gives club members access to their routines and regimens when they can't make it to the gym. Garrett believes that although it's one of the most engaging amenities, group fitness has also traditionally been one of the largest operating expenses for facilities. To address this issue, Fitness On Demand is uniquely positioned to help the customer add more value with digital video programming by offering added frequency, availability, and a variety of training formats, while at the same time reducing labor costs. Clubs can seek out technologies like Fitness On Demand to offset the expenses of underutilized space and for a digital replacement to live group classes. Personalization is one of the top appealing factors we see over and over when researching the behaviors of fitness consumers. In order to personalize products and services, you need to intimately know your target demographic. This requires we understand our customer's behaviors, whether it be a current member or a new prospect. Achieving this comes down to the value of data we collect as club owners and operators, and how we act and execute based on that information. In order to effectively integrate and utilize new technologies in the club, there needs to be continuous education for fitness professionals and staff members. It's imperative to take a top-down leadership approach and ensure every level of employee within the club, from management to the trainers and sales staff, knows what the integration of any new technology will achieve, has a complete understanding of why they are doing it, and can easily communicate that to members and new prospects. As we fast-approach the one year anniversary next month for the fitness + technology podcast, today we're guided through some of 2017's most critical insights at the bleeding edge of trends and forecasts in our industry with the president of the Fitness Industry Technology Council, Bryan O'Rourke. In this special 50th episode, we cover so much ground and discuss the pivotal fitness and wellness devices for the cloud so that our club operators, owners, and trainers can embrace the meaningful technologies and avoid falling behind the competition. We learn from Bryan about his take on the the way our 3 basic models in the commercial fitness space are being disrupted, how technology makes you the CEO of your own health, why more people die today from overeating than from famine, and the social and economic forces at play that have a direct impact on how all of us will do business in fitness in 2018 and beyond. If you've been listening to the show for a while and have received value from one or many of our expert guests, simply leave us a five star review for the podcast. Your voice helps the show reach more leaders and savvy fitness-tech minded professionals like you find the show, and gives our industry what it needs most right now: the credible, trustable, and tactical information to thrive in this digital era. Over the past 50 shows, we've made a big focus on simplifying a sometimes cumbersome job of finding the reliable and detailed information about the trends occurring in the industry so your business can make informed technology decisions, and in this powerful conversation, we also uncover with Bryan how the rising level of consumer expectation will impact the need for club owners and operators to both embrace and implement the key technologies that will make a difference. With legacy technology systems in the United States driving risk aversion and slowing technology adoption in the fitness industry, what can we do as a fitness technology community to close the gap and serve more clients than ever before? The answer to that question and much more takeaways for club owners, operators, and fitness pros in this episode with Bryan O'Rourke. This model is about selling first and lacks a focus and emphasis on the health outcomes of members. People connect to their communities in a socialization construct with exercise being the main component. We are seeing this become more present with obstacle course races such as Spartan and Tough Mudder, and engaging group fitness activities such as Zumba. This is the smallest piece of what we see in today's marketplace, although Bryan feels it's where we will find the most growth in years to come. People are realizing that with the rising costs of health care and the wellness epidemics we are facing, there is a serious need for a more holistic, proactive, and results-focused approach from their trainers and facilities. As the speed of technology increases, it's more important than ever for club owners, operators, and fitness professionals to make it a priority and "bake" into their weekly calendar the job of seeking out reliable and detailed information about the trends affecting our industry. This habit will provide the ability to make informed technology decisions and ensure members and clients receive the user experience the market is demanding. The advancements in tech have created a seamless fitness experience at many leading facilities, and clubs that fail to stay on top of the current trends members want in today's marketplace will surely lead to falling behind the competition. To succeed in this new era of the fitness industry, it's imperative that business models include an emphasis and focus on the health outcomes and results of their members - not just new business units. As our population is suffering from more disease and the rising cost of health care becomes unsustainable, people across our nation are now seeing that a proactive and results-oriented program is of extreme importance. Bryan believes that in this age of over-information, it's imperative that we don't fall into paralysis by analysis and fail to implement new technology. We are reminded in a previous episode by Marty Weems from Team EXOS that we have to keep pushing forward in this regard. With Bryan's leadership and through this show, you can trust that the Fitness + Technology podcast will continue to seek out the most trustable information you depend on as we move faster towards wellness, fitness, and betterment technologies that are changing the landscape of how you run your fitness business. With the fitness industry poised to further expand its impact and transformation within the wellness industry space, we're growing smarter today from one of the world's most influential minds in the active healthy lifestyle sector, Lee Embley, to discuss the best-of-the-best takeaways from his 40+ years around technology innovation and digital trends. With his impressive body of work, he is now leading a mission to connect the role of fitness to an even larger ecosystem of wellness, driven by artificial intelligence and big data sets through his up and coming platform Optimal AI Coach. We know now more than ever that fitness has been and will always be a powerful and integral piece in what is at the core of all club member's goals, which is to be healthy and well in their body, mind, and spirit, so on this podcast we're excited to unpack the nuances of what Lee believes is the "biggest miss" right now in the fitness industry, how human longevity plugs into our standard fitness models, why the ultimate value proposition for wearable technology is wellness and not just fitness, and how Lee's own health journey has inspired him to radically shift his focus in the coming years. With fitness industry experiencing the most radical transformation in decades, what are the most powerfully distilled concepts that club owners, operators, and fitness professionals must understand when it comes to fitness and wellness technology? The answer to that question and much more takeaways for club owners, operators, and fitness pros in this episode with Lee Embley. ProWoman Sports USA first all women sporting goods retail brand, merchandising functional design, fashion and leisure wear, early footwear product development with ProWoman Strider the first women lasted track and field running shoe, equipment to the fit-active female market. PWS became the first national sales organization to secure a exclusive distribution with hundreds of colleges and universities with female specific sports programs. Acquired, Tennis Lady Group UK. Mr. Embley founded the NCSB, the first sports, performance, data and evaluation platform. An athletic scouting and evaluation system to enable high school athletes who are not recruited a system to evaluate their athletic skills by professional scouts. Acquired, Pro-Serve, as well as "Radiance Rewards," the first AHL credit cards for health fitness conscious women. His work continued with Leap4Life the first "Wearable Marketplace" designed for the health and fitness consumers to fully experience the motivation of active lifestyle. L4L hacked and mitigated the sustained engagement factor with a unique combination of attributes. The methodology and technology applied data science and social to achieve success. His latest body of work is the "Optimal AI Coach: O.AI.C" an application to enhance fitness and performance through deep learning and integration of lifestyle data via technology. All the data collections are in place, wearable, mobile, retail to create the next generation highly personalized coaching system. How understanding the S.T.E.E.P. analysis will define a way to determine shifts triggered by seminal events in Social, Technological, Economic, Ecological, and Political segments. Lee reminds us that the need for speed creates new value. “Things” only have value when they are put in motion. Anything standing still is valueless, be it money, inventory, information, an empty hotel room, data, machinery, technology, people. Early warning systems are designed to foretell of impending disaster. Those in any industry who ignore the warnings will eventually fail, as seen with the assault on the retail sector which is not a surprise. Lee’s strategy is to identify weakness or obsolesce within a sector under siege and define alternative strategies. Always focused on the evolution of the consumer of the product or service enables Lee or any savvy professional to spot an early trend before it grows into a recognizable market. With a large focus on collecting data, Lee believes that it's the use of pattern recognition via artificial intelligence that will truly guide the transformation in our fitness industry to serve an even larger ecosystem of wellness. When we look at the wearable tech component, this is the area that is most ripe for disruption. Lee believes that the active lifestyle persona must be taken into consideration including their body, mind, and spiritual capacities in order for technology to serve their deepest needs. With the exponential growth in wearable technology's ability to support these three capacities the future of fitness and wellness technology is both inspiring and promising. The Big Miss. Change is soft cultural, hard to define...Really! Cash In On Your Data! For episode 044 we're excited to bring you one of the most sought after leaders in our space for an important discussion around data collection accuracy and its relationship to the growing demand for AI and machine learning in the fitness industry. We're talking with our returning guest, Dave Wright, the CEO of MYZONE for his second appearance on the show to explore the impact of collecting fitness data for practical use, the difference between incidental versus concerted activity when we look at fitness consumer activity, where the gaps are in adoption and how our industry can rise to the demand for true omnipresence. We're also uncovering how MYZONE is proactively educating fitness professionals and leaders on how to take in the right data set, understand it, and use technology to support executing a sustainable health and fitness experience for the new era of our consumers. With more data sets being delivered than ever before, what are the most important ones and what do fitness leaders, trainers, and operators really get to pay attention to not only for ROI, but to deliver an enhanced customer experience? The answer to that question and many more takeaways for club operators, owners, and fitness professionals in this episode with Dave Wright. As operators and owners begin to use wearables and data sets more and more via incidental and concerted activity from their fitness consumers, Dave believes the most important thing is attaining trustable data. Your database in order for artificial intelligence or machine learning to be leveraged powerfully must be cleaned and trustable. Once these data sets are verified as being "clean" then you can start plugging in long-term behavior change strategies for the customer's journey. For savvy club owners and operators, as well as tech-minded fitness professionals, gathering all the right information about fitness and technology can be challenging at times. In addition to the Fitness + Technology Podcast, Dave suggests partitioning time for dedicated research around fitness tech trends by simply going to the Kickstarter website where you will see the intentions and possibilities around fitness tech in our space. Now is the time to set aside calendar blocks for this research, as staying on top of tech trends will help drive fitness facility and career success as AI and machine learning useage exponentially grow. With the rise of demand from all customer segments who want that seamless omnipresence from clubs both at home and inside the 4 walls, Dave sees that we are extremely behind the curve as an industry. He spoke to us about the "frictionless experience," otherwise known as the use of automatic triggers combined with machine learning and AI technology that will deliver seamless interactions required between the customer's exercise, activity, and lifestyle data sets that will change the way we do fitness, forever. Today on the podcast get ready for an in depth interview with not just one, but three high-level fitness industry professionals from EXOS, a leader in the field of human performance employing more than 3,500 people in over 400 locations worldwide. We're exploring how new technologies are force multiplying the reach and efficacy of fitness professionals to deliver an intimate and powerful experience for both clients and athletes across the world. This interview is going to inspire you and be quite thought-provoking as we challenge the conventional wisdom in the fitness industry for one of the most powerful conversations we trust this industry must go with the use of technology to finally scale a trainer and a team's services to a level of sustainability through what team EXOS calls "force multiplied fitness training." As you know if you been listening to the show for a while or if you spent years in our space, the hour-for-hour trainer model is undergoing the largest disruption in over 50 years. In our opinion, it's right on time because there are too many of our fitness professionals leaving the space with an incredible amount of service and passion left inside them. The technology we're discussing today has the power to shift the service models upside down and radically transform how our industry will grow. Just how much time do we have until the "dream dashboard" comes to fruition, including all the biomarkers, steps, activity, machine learning and artificial-intelligence-coaching combined with the irreplaceable human connection from a professional breaks ground in our space? The answer to that question and much more takeaways for club owners, operators, and fitness pros in this episode with Marty Weems, Stefan Underwood, and Tristan Pierce on this episode of the fitness + technology podcast. Marty joined the EXOS team (formerly Athletes’ Performance) in 2006 as its first Vice President of Sales. His business experience includes the telecom, wholesale distribution and pharmaceutical industries before joining EXOS. Since 2009 he has focused on developing international export business to new markets. Marty earned his undergraduate degree at Furman University (South Carolina) in addition to a MS Education and MBA from the University of Tennessee in Knoxville. He now specializes in developing strategic solution plans for elite international sports organizations utilizing the services and products of EXOS and its partners. Marty is a leader in three areas of the business: Education for industry professionals; Consulting and support services for international sports teams; and developing EXOS facilities in foreign markets. Marty’s international business experience includes China, Japan, Taiwan, Mexico, Australia, Russia, Germany, UK, Colombia, Brazil, Qatar, Bahrain, Kuwait, and Israel. As a services exporter, EXOS has been recognized as 2015 “Exporter of the Year” from the City of Phoenix; 2015 “Export Excellence” Award from Arizona District Export Council and 2016 President’s (POTUS) “E” Award for Exporting Excellence. Fast Company magazine has recognized EXOS in its “Top 10 Most Innovative Companies” lists in 3 of the past 7 years. Stefan Underwood has been with EXOS (Formerly API) since 2011 and brings 14 years of experience as a Performance Specialist to the EXOS team. Currently, Stefan serves as the Director of Continuous Improvement at EXOS, sitting within the Performance Innovation Team. Underwood oversees all internal education efforts within EXOS. Prior to this latest role, Stefan served as a Performance Specialist for EXOS and applied his diverse skill set to a variety of opportunities including Tactical Education, Performance Education and Movement Coach for the NFL Combine program in Florida. Stefan is a certified USA Track and Field coach (USATF), NSCA Registered Strength and Conditioning Coach (RSCC), and Certified Strength and Conditioning Specialist (CSCS). Prior to EXOS, Underwood has stops throughout his career as the Manager of the NSCA HQ Performance Center in Colorado Springs, the Head Strength and Conditioning Coach for Colorado College Men’s Hockey (NCAA Div 1), and experience working in the private setting with professional athletes from NHL, MLB, UFC, IndyCar, NFL, NBA, Olympic Sport, in addition to extensive experience with youth developmental programming. Throughout his career he has brought his practical experience and passion for performance to presentations on 4 continents and has been a speaker for EXOS, the NSCA, NASM, and other private events. Tristan Pierce helps drive the design of EXOS product and programs with thought leadership, research, and cross-team collaboration. His education background is in kinesiology and his professional experience includes two years of product and program design and seven years of performance coaching in a variety of settings with primary focus on general population. He loves to mountain bike, and so far has only had to get stitches once. What is force multiplication in fitness and where does fitness technology plug in? Skillset: The future of sustainable excellence in the industry lies within the data. Disruption: Being able to force multiply yourself as the coach or trainer through the use of technology to deliver a intimate and powerful experience for the client or athlete. The bleeding Edge of Technology + Fitness: What will we do to connect these gaps? What is the JOURNEY Platform for EXOS? Uncovering Corporate Wellness programs for Google, LinkedIn, ITEL, and a 300+ Staff for the US military bases to keep armed forces healthy and sustainable. Medical Fitness Centers: How will technology and trainers close the gap between gyms and hospitals? Team EXOS reminds us that embracing technology is just the beginning to mass adoption and transformation. For a success, a tech-minded fitness professional must execute on "simple things done savagely well" and not allow themselves to get lost in all the noise and programs out there. Marty Weems reminds us that no matter what tech you use, you must do the things that get the job done each day by executing forward. The danger of technology disconnecting us on a personal level is real, but only if we choose to not be mindful and have high integrity behind the usage of fitness technology tools. Team EXOS believes that when there's an opportunity for human interaction in the club, it needs to happen as part of a great relationship with old-school tools like enthusiasm and customer service combined with some of the most powerful technology we've ever seen. To truly force multiply fitness training it takes an open mind and a clear vision about what is possible when we combine humanity and technology. With the work of team EXOS in an industry with a high value on transforming people's lives through fitness and health, there is no doubt that we are on the path to the most incredible digital transformation of our lives. For episode 42, we tap into the roots of what technology is making an impact on the floor of one of the fastest growing studios in our space, Delta Life Fitness with CEO, Josh Cherry. In our previous episodes around fitness studios and making fitness fun through tech and gamification with Lindsey Rainwater and Shannon Fable we've talked about what various cloud-based solutions and tactical approaches are important to create an enhanced user experience, but on today's podcast we take an even deeper dive into what is driving the growth of this up-and-coming franchise that is utilizing data sets for an outside the box gamification fitness experience for the growing niche of female-focused training. You'll learn from Josh Cherry on this episode how Delta Life Fitness uses a digital leaderboard in the lobby to harness the social contagion factor for their female members to engage inside the four walls and create the emotional hook to make better choices in the other 23 hours of their day. You'll also learn some of the biggest lessons that Josh experienced firsthand in growing Delta Life Fitness from a hot asphalt parking lot to just a few years later having multiple successful facilities nationwide, what are the three pillars of gamification success for all studios to deploy, how the utilization of private Facebook groups is shifting customer expectations when it comes to real human connection, and why Josh believes that a digital assessment for posture and client intake is pivotal to convert a new member into a lifelong customer. With all the technology solutions out there that claim to "gamify" the fitness studio experience, what are the most powerful actions that leading-edge facilities are taking through technology? The answer to that question and much more takeaways for club owners, operators, and fitness pros in this episode with Josh Cherry. Josh Cherry is the Director of Franchising and CEO and Co-founder at Delta Life Fitness: a women’s only group training workout segmented into intervals of cardiovascular and strength training. By incorporating the science of the female metabolism, Delta Life’s training is specifically designed to maintain a target zone that stimulates metabolism and increases energy. Josh spent almost 14 years in the Marine corps before helping co-found this female-focused boutique studio and graduated from Texas A&M university. Led by skilled trainers, participants use a variety of equipment including TRX suspension training, free weights, and battle ropes, burning up to 900 calories including after-burn. The results are more energy, visible toning, weight loss and extra calorie burn post-workout. Women throughout the United States are seeing the changes, both physically and mentally. As Delta Life Fitness grows, they continue to look for franchisees to assist with their expansion. Josh reminds operators and fitness professionals that when it comes to choosing technology to gamify your facility's experience, in order to transcend overwhelm you must keep it simple: know what makes you different, and find one or two really great things that allows you to gamify the process for your niche clientele. Accept that it may not work perfectly the first time and that you may have to revamp a few times to learn what works best. It's not just about people and is not just about technology, you get to accept that it will take time to find the balance between the two. When it comes to the moving the needle of profit through gamification, knowing exactly the type of member you are serving and exactly how you want to serve them is paramount. Josh believes whether you use technology or not, the gamification model has to be driven from specificity to succeed..
As the technology around fitness and medical services continue to grow, Josh speaks his truth that the days of trainers and doctors only working face-to-face with clients are about to be a thing of the past. Gamification is one of the necessary components of a bigger ecosystem that will provide apps for a mobile experience that is 100% seamless and based on the data of biometrics. This will allow the professionals to monitor us, the end-users, without us frenetically monitoring ourselves. In the same regard of enhanced medical and fitness service delivery models we also know that the intention of saving people time, money, and delivering better health through new technology will always be more powerful than just the technology itself.